Victory for today’s young people and all living things to come. Now take action! This time next week, Washington could become the first state in the union committed to walking the path back to 350 CO2 in our children’s lifetime. By Wednesday July 8th, the Department of Ecology must respond to the court in the historic victory, Zoe & Stella Foster v. Ecology. It’s a great day for Washington State once Ecology decides to do the right thing for our children. Call now and get your friends to call too! In a no-nonsense decision that calls out bureaucratic delay in the face of urgent and dire climate consequences, a judge in our Washington case just sided with the 8 youth petitioners, and ordered the state to reconsider its denial of the youth’s petition for emission reductions in accordance with current science. Please read the 4-page decision and press release. Importantly, the judge ordered the state to consider the youth’s scientific evidence and to respond to the need to bring atmospheric carbon dioxide levels to below 350 ppm by 2100. The State must notify the court in two short weeks whether it will amend or affirm it’s denial of the youth’s petition in face of the court’s and the youth’s scientific evidence. 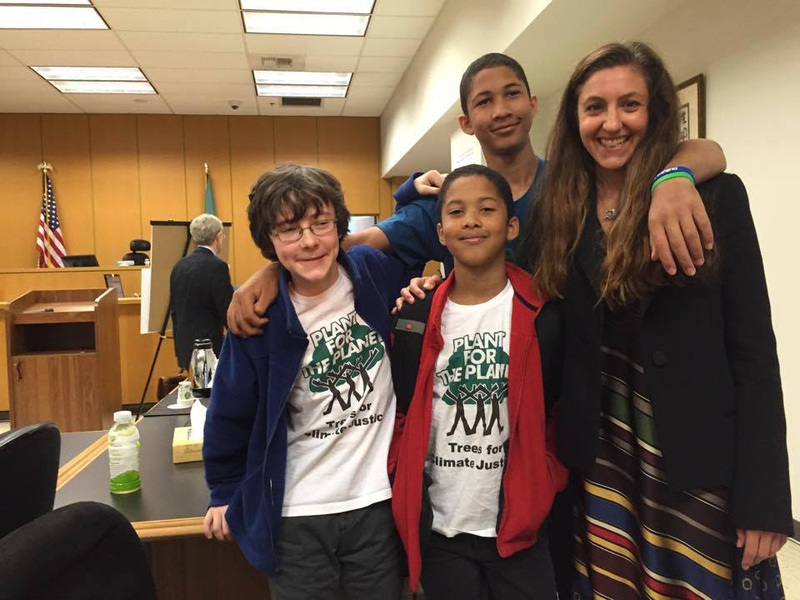 Congratulations to our youth petitioners of Plant for the Planet Academy and our outstanding WELC attorney leading the Washington case, Andrea Rodgers. or donate to “Climate Change for Families” near the bottom of the website, or to Plant-for-the-Planet. Posted on July 1, 2015 February 20, 2016 by fostertudePosted in UncategorizedTagged children's rights, Climate change, Environment, historic, legal victory, Our Children's Trust, Plant-for-the-Planet.